Generally, for some solar simulator manufactures, the measurement of irradiation non-uniformity is made by placing a PV cell artificially and point by point on each measuring point on the solar module. It records each corresponding output voltage of PV cell. It is time-consuming and easy to produce measurement error. If either an XY table or a multi-axis robot is applied in this case, it is ot only expensive but also difficult to carry and setup. 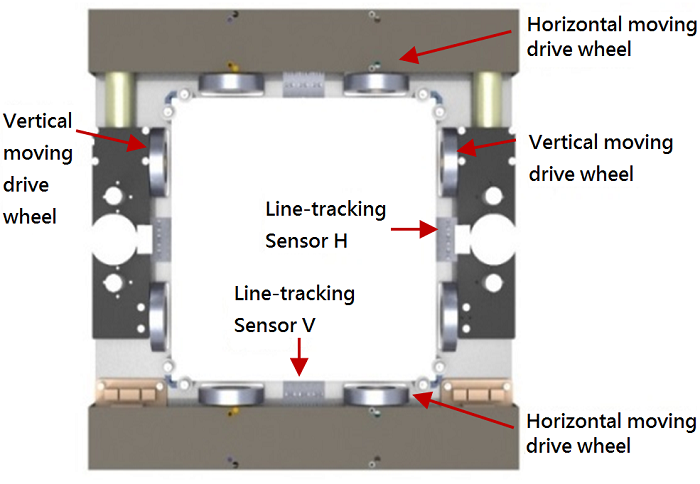 Hence, an innovative and automated measurement system, which consists of both a self-developed smart robot and a monitoring and control system, is proposed in this paper to solve aforementioned problems. The monitoring and control system, i.e., constructed by a PC and a self-developed LabVIEW-based application program, plays the role of remotely commanding the operation mode of a robot, receiving the irradiance data being transmitted from the robot and calculating the irradiation non-uniformity. Once the irradiation non-uniformity is calculated, some operations are made to adjust the irradiation parameters of the solar simulator such that the irradiation non-uniformity can meet the specification, i.e., 2%, 5%, 10% for class A, B or C of solar module, respectively. S. J. Polly, Z. S. Bittner, M. F. Bennett, R. P. Raffaelle, and S. M. Hubbard, “Development of a multi-source solar simulator for spatial uniformity and close spectral matching to AM0 and AM1.5,” IEEE International Conf. on Photovoltaic Specialists, IEEE Press, June 2011, pp. 1739-1743. M. Sun, G. Zhang, B. Yang, X. Tao, and G. Ding, “Optical system design of solar simulator for testing meteorological radiation instrument,” International Conf. on Optoelectronics and Microelectronics, IEEE Press, October 2012, pp. 600- 603. C. Domínguez, I. Antón, and G. Sala, “Solar simulator for concentrator photovoltaic systems,” Optics Express, vol. 16, no. 19, pp. 14894-14901, 2008. Q. Meng, Y. Wang, and L. Zhang, “Irradiance characteristics and optimization design of a large-scale solar simulator,” Solar Energy, vol. 85, no. 9, pp. 1758-1767, September 2011. S. Kohraku and K. Kurokawa, “New methods for solar cells measurement by LED solar simulator,” Proc. of 3rd World Conf. on Photovoltaic Energy Conversion, IEEE Press, May 2003, pp. 4-7. H. Sabahi, A. A. Tofigh, I. M. Kakhki, and H. Bungypoor-Fard, “Design, construction and performance test of an efficient large-scale solar simulator for investigation of solar thermal collectors,” Sustainable Energy Technologies and Assessments, vol. 15, pp. 35-41, June 2016. J. Dubard, J. R. Filtz, V. Cassagne, and P. Legrain, “Photovoltaic module performance measurements traceability: uncertainties survey,” Measurement, vol. 51, pp. 451-456, May 2014. R. Eke, A. S. Kavasoglu, and N. Kavasoglu, “Design and implementation of a low-cost multi-channel temperature measurement system for photovoltaic modules,” Measurement, vol. 45, no. 6, pp. 1499-1509, June 2012. Y. Yuan, Y. Yang, and Z. Ya, “Research of solar simulator irradiance non-uniformity measurement,” IEEE International Conf. on Electronic Measurement & Instruments, IEEE Press, October 2011, pp. 307-310. “ARDUINO MEGA 2560 REV3,” Products Retrieved from https://store.arduino.cc/usa/arduino-mega-2560-rev3, June 1, 2017. C.-H. Hsieh and X.-Z. Zh, “Development of an Automated Measurement System for Checking Irradiation Non-uniformity of Solar Simulators”, AITI, vol. 3, no. 4, pp. 147-156, Jul. 2018.